Camping is a favorite past time for many families. However, there seems to be a common thought that this activity is best reserved for summer and spring months. Luckily, this is just not true. There are many destinations that offer excellent weather, and seasonal activities, for camping in the fall. If you worry about the weather causing difficulties, you might consider camping in your own backyard. An unexpected shower can really rain on your camping trip, but when your warm, dry house is only a few steps away, it’s much easier to take the chance to go camping. Not only that, if you end up getting too cold, you can always run back inside and grab another blanket. While this may seem like a given, you may find a great season for camping in some of the southern states. Many have warm temperatures year round and you can fish and hunt, as well. Many of these warmer areas can provide for a great weekend getaway. Consider Florida, California, Arizona, or Texas for some great fall camping locations. You will also find that some campsites are even cheaper than normal in the fall. Temperatures are much cooler the closer you get to the water. If you are looking for a warm spot to camp, find areas away from lakes, rivers, and streams. You will also find that many animals will start looking for warmth when the temperature changes. One of the best ways to camp in the fall is with a pop up camper. These spacious space savers are a great way to enjoy the fall weather without having to risk the elements. Most are equipped with heaters and many of the comforts of home. If you want to use a pop up camper, your choices are unlimited as far as fall camping destinations. While this may not seem like an ideal fall camping destination, you’ll find few places that are more beautiful during the fall than the mountains. 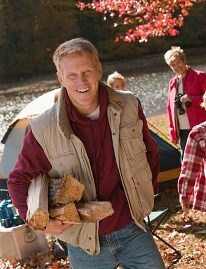 The changing colors and clear crisp mornings provide a fabulous backdrop for a camping trip. While you may need to pack some extra layers to keep warm, as well as some additional supplies in case of a snow shower or two, you will probably enjoy the adventure more than you can imagine. Fall camping destinations can vary depending on your personal preferences and how far you are willing to travel. While some people are very content to spend a night camping in their own backyards, others will long for the adventure of the mountains. Whichever you decide, you can certainly enjoy the season by following the above tips.